You are not done practicing your baritone. Don’t you just love the way kitties can snuggle into any comfy space and be content. My cats enjoy sleeping on my suitcases and giving them a nice fur layer (right before we take a trip, of course). They also love curling up in baskets of clean laundry…sigh. Yep, clean laundry is a favorite spot here as well. 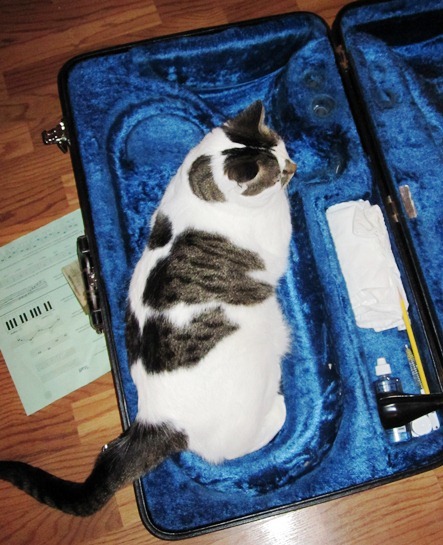 More amazing, the cat and the dog don’t seem to mind when my daughter plays her baritone. Trust me, it’s loud.